In 1993 Don Cusson went out in search for the perfect location to start his new business. South Windsor was the town and Mascolo road was where he found his first building. Don had been involved with automotive and equipment repairs for many years. He started his career at a Ford dealership and then worked for an independent garage for many years. With his wife Kathy and 4 small children he started Cusson Automotive with 2 employees and 70 hours a week of work. Don handled both mechanical repairs along with all the required paper work that goes with it. After seven years of growth and success it was time to expand. Don bought and rebuilt their current location, right down the road from where they started. He turned a run-down lot and building into a state of the art repair facility. Cusson Auto has grown in many ways both with employees and our ability to service the motoring public. Our current 12 employee shop can handle anything from diagnosing electrical, drivability, engine, or transmission problems to tires and alignments all using the latest technical equipment. 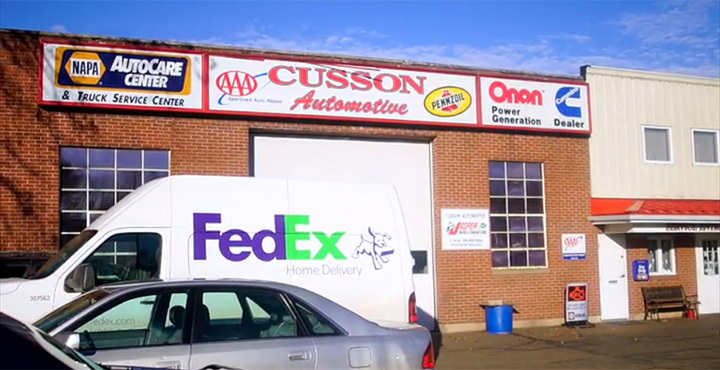 The truck side of Cusson Auto is designed to handle fleets of all sizes. Whether you’re driving a Sprinter Diesel van or have a fleet of over the road class 8 trucks, we can customize any services to fit your needs. Cusson Auto is affiliated with such companies like Napa. We are a Napa Auto Care and Truck Center, 24.000 or 24months of travel warranty available, Cummins Engine authorized warranty facility along with Meritor, and Spicer products. Onan generators are another big part of our offered sales and service, from home stand by to motorhome gas or diesel units. The motor home industry has been through a few tough years but we have maintained a constant presence on the repair side . Walk in customers are always welcome for such items like Aeroquip hoses and fittings made while you wait. Onan parts that we stock are for those that like original equipment or we are capable of looking up parts on our in house computer system. Servicing the RV community has been a large part of our business for the past 15 years. Cusson Automotive has grown and adapted to the needs of the community over the past 25 years and plans to do so for 25 more!